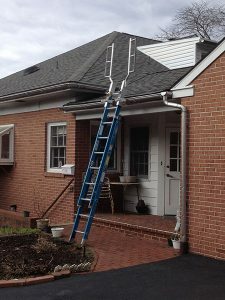 EXTENSION LADDER SAFTEY: Another step in the right direction. Expose to and discuss with as many workers as possible during Stand-Down week. NOTE: OSHA is planning on 5,000,000 workers to be exposed to the Stand-Down in 2018. Making workers aware of the danger of ladder falls is the goal. The OSHA Alliance recommends holding horizontal handholds only. Our advanced theme is; Reduce ladder fall exposures at work and home! Product: GrabSafe Portable Ladder Extension Mark II. Supplier: LeadingEdgeSafety.net. GrabSafe feels safer for roof access and reduces fall exposures. 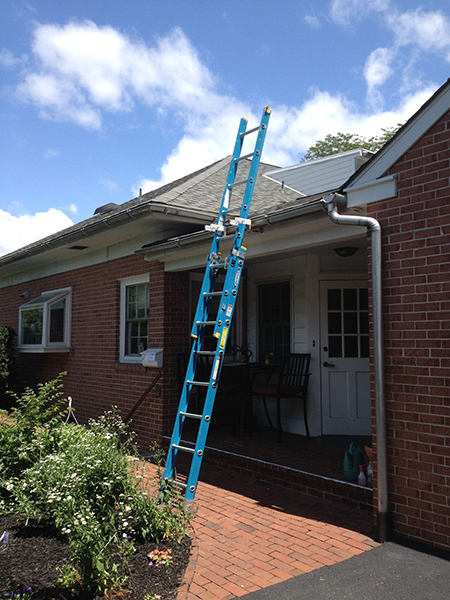 3-foot ladder extension product is safest for roof access transition. Fits to any existing ladder meeting ANSI A14.2 metal and A14.5 fiberglass. Meets OSHA ladder extension requirements: Clark Interpretation12-22-05. Meets worker expectations for this walk-through ladder, no step around. Aluminum – lightweight addition 6-pounds on each side. GrabSafe runglet is 1-11/2 –inches diameter, the optimum size for handhold strength. One less ladder for contractors to carry on the truck/van! Meets findings for Ph.D. thesis for horizontal handholds (rungs and grab bars). Reduces dangers of vertical handholds. Increases confidence in ladder use. Hold rungs and runglets ONLY on ladders for handhold reliability (especially for 18-24-year-old workers). Tested for 1000-pounds of strength without distortion. 15-degree angle enables many more applications, e.g. painting and excavation. Always tie down ladder before using. Climbing ladders without fall protection represents billions of fall exposures. Falls are the leading cause of work deaths. Ladder accidents in 2014 represent over 20% of all work fall deaths. Ladder fatalities have risen 18% since 2011 through 2014. Excellent for use with 16-foot and 24-foot extension ladders. Takes seconds to install at ground level each side. GrabSafe locks onto your ladder and tightens for security. Holding vertical siderails can cause the hand to slide; therefore only hold rungs. Did you know: Half of all OSHA ladder citations are for failing to extend 3-feet above step off level. 3-feet GrabSafe will quickly pay for itself! 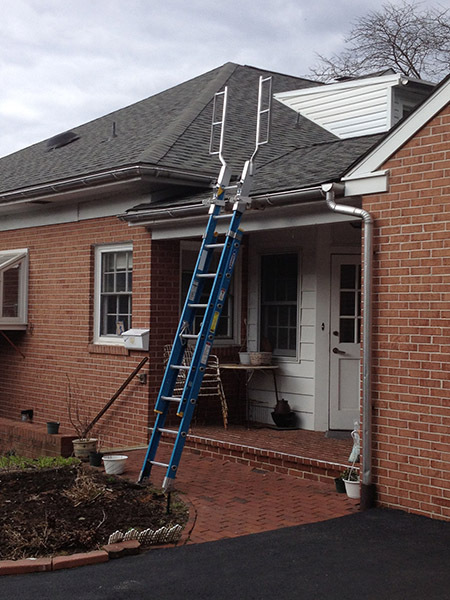 DEMO: Requirements: Secure your extension ladder on a low commercial or residential building roof. GrabSafe Portable are $165 plus shipping from Leading Edge. Safety (1-800) 990-2990, att’n Cody for next day delivery! Gather group(s) 1-20 workers; invest 1 hour discussing ladder safety issues with your experienced ladder climber. May 7-11 state the training given e.g. ladder safety, by your company and its length, location and date. All attendees will then receive an OSHA Certificate of Participation. Dr. J. Nigel Ellis was a guest speaker at the National Safety Council Congress and Expo on October 9, 2016 in Anaheim, CA. Dr. Ellis’ presentation was titled, “Three Point Control for Ladders”. The slides from this presentation are available here. Dr. J. Nigel Ellis was a guest speaker at the Slips, Trips and Falls, The Way Forward Conference on October 5, 2016 in London, England. Dr. Ellis’ presentation was titled, “Fragile Roofs: Skylights/Rooflights”. The Future of Plastic domes. Dr. J. Nigel Ellis was a guest speaker at the 21-hour Philo Seminar on September 24, 2016 in Detroit, MI. Dr. Ellis’ presentation was titled, “Fall Protection for Cell Towers/Poles/Rooftops”. The slides from this presentation are available here. The Way Forward: An Update on Falls at the same Level, Stair Falls and Elevated Falls. This is practical and research information on what is new for building owners, specifiers, safety managers, architects, risk managers for Hotels, Manufacturing, Food, Transport, Leisure, Health Clubs etc. The safety requirements for employees working on scaffolds as defined by OSHA are often overlooked by many, but could essentially be the difference between life and death falls. The safety requirements for employees working on scaffolds as defined by OSHA are often overlooked by many. This could essentially be the difference between life and death falls. Without a doubt, scaffolds should be able to hold it’s own weight and four times the maximum intended load applied. In addition to this, OSHA states that “each employee more than 10 feet above a lower level shall be protected from falls by guardrails or a fall arrest system.” However, those who are on a single-point or two-point adjustable scaffold are required to be protected by a personal fall arrest system as well. Making sure construction companies understand when each requirement is needed is essential to the safety and protection of their workers. In addition, employers are required to train scaffold employees on the hazards and dangers. As well as, how to minimize the risk of injury as well as, proper procedures to follow. Without the proper training of employees who use scaffolds, companies are not taking full advantage of the safety equipment required. Overall, following scaffolding regulations are essential to protection of employees. The training on these systems are absolutely imperative and should never be overlooked. For more information on fall protection, fall safety training, and procedures, please visit FallSafety.com where safety is #1. The third annual National Safety Stand-down will take place from May 2-6, 2016. It is to raise awareness of preventing fall hazards in construction. is this year’s theme. Anyone who wants to prevent falls in the workplace can participate in the Stand-Down. In past years, participants included commercial construction companies of all sizes, residential construction contractors, sub- and independent contractors, highway construction companies, general industry employers, the U.S. Military, other government participants, unions, employer’s trade associations, institutes, worker interest organizations, and safety equipment manufacturers. Although double-lanyard systems remain a seemingly obvious answer for moving horizontally on many present structures without the provision of horizontal lifelines, their use is cumbersome. An interesting variant used in Japan employs a simpler system that includes a keybox attached to the worker’s belt. One lanyard key is inserted and remains attached until a second lanyard key is inserted in another opening. This action ejects the first lanyard key and allows unhindered transfer past obstructions or supports while ensuring continuous protection. See “Introduction to Fall Protecton, 4th Edition” page 242. Order your copy of “Introduction to Fall Protection, 4th Edition” today. This invaluable resource will take you from the structure design stage to post construction maintenance. Click to find out more!